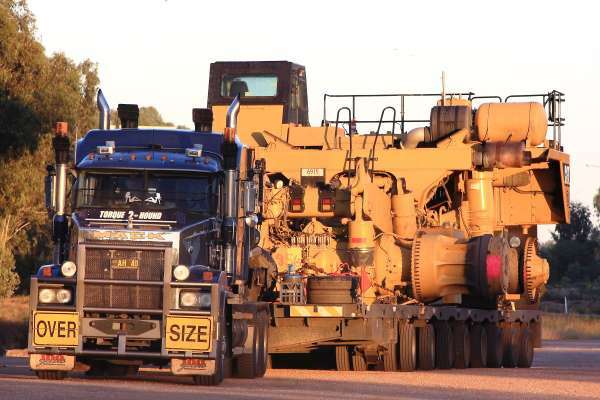 A heavy vehicle is one with a gross vehicle mass of more than 4.5 tonnes. These vehicles have restrictions for the safety of other road users. Sometimes they are allowed to do things that other road users aren’t, and sometimes they have their own lanes or speed limits (as indicated by the signs on the left). All other loads must be restrained. 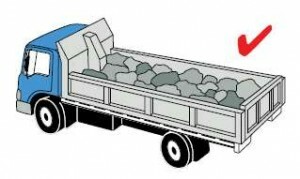 It’s against the law to drive a vehicle where the load isn’t secured. 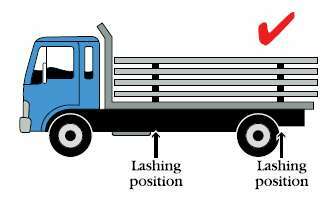 When using tie downs to restrain a load the angle of the tie down should not be less than 30 degrees otherwise it doesn’t place enough downwards force on the load it is restraining. 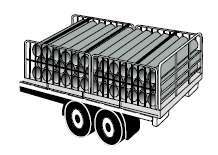 Dunnage is packing placed under or between parts of the load so that it can be unloaded with a forklift or lifting slings. It’s made of rectangular or square wood that is strong enough to support the load. 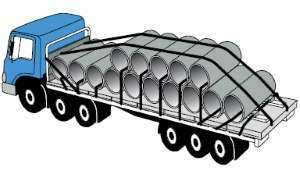 The correct dunnage position for long rigid loads such as steel pipes is as above as this means they are less likely to move when restrained. 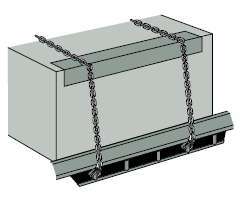 The restraints are placed at the same points as the dunnage. Blocking is where a load is restrained against the headboard or bulkhead and this is the most important part. 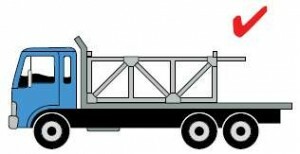 In the diagram on the left, option 3 is the best way to place the load if the axle weights aren’t exceeded, with the bulkiest items up against the bulkhead so that they don’t move under braking, which is called load shift. Option 1 also is blocked, but has more weight over the rear which can make steering less effective, and option 2 isn’t blocked and the load could possibly slide forward under braking. 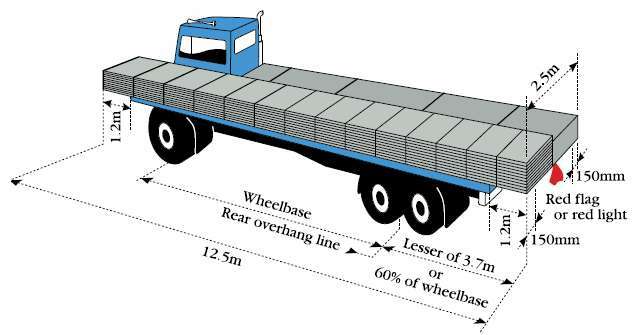 The majority of the load’s sustained force will be under braking, and any load restraint system needs to be able to restrain at least 80% of the load’s weight in a forward direction, 20% in a vertical direction and 50% in a sideways or rearwards direction. 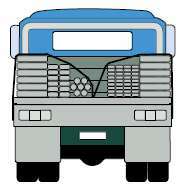 A vehicle monitor is a device like a tachograph or ‘electronic black box’. It records the vehicle’s operation whether the engine is on or off, including the speeds, distances, lengths of time the vehicle is moving or stationary, the times used, the dates used, the driver’s identification, the driver base (i.e. where the driver usually works from), and the locations visited. Work time includes all tasks you spend related to the vehicle’s operation such as loading and unloading; inspecting, servicing or repairing the vehicle; inspecting or attending to the load on the vehicle; attending to passengers on a bus; cleaning or refuelling the vehicle; performing marketing tasks relating to the vehicle; and recording information. You must not borrow someone else’s work diary to record your work and rest hours. 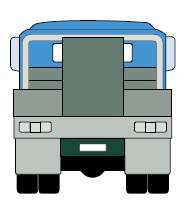 Usually ROAD and TRAIN are displayed either side of the number plate that is in the centre, but this position is not mandated and it can be displayed anywhere on the front of the hauling unit that is visible. 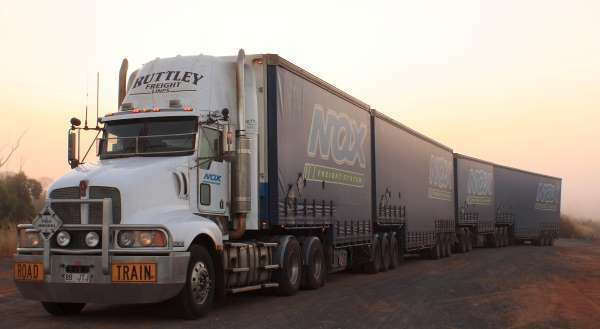 Only vehicles classified as a road train are allowed to display signage indicating they are a road train, so no road train signs must be displayed on a vehicle that’s not a road train. If you see the following sign then it’s likely that you are approaching a steep decline and you should change gear early to let engine braking take over rather than risk brake fade. 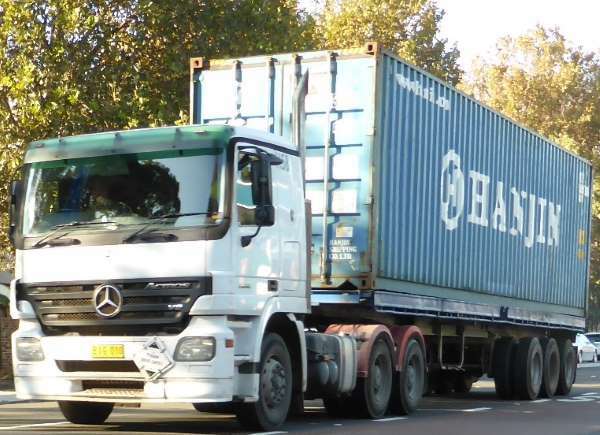 Many accidents with long and large vehicles occur when drivers are reversing and can’t see where they are going. 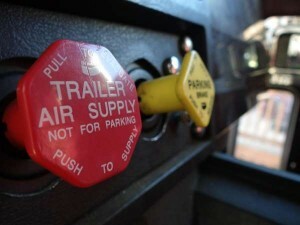 Use a helper/guide/spotter behind your truck and/or trailer to help guide you while you reverse. Agreed hand signals help you to effectively carry out the helper’s instructions. 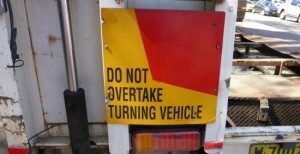 If you have signs saying ‘DO NOT OVERTAKE TURNING VEHICLE’ on the back of your truck (and it is over 7.5m long) then you are allowed to make a left turn from a lane next to the left-hand lane. You will still need to check your nearside mirror and your blind spots in case another road user hasn’t seen your turn signal and moves up on your left.